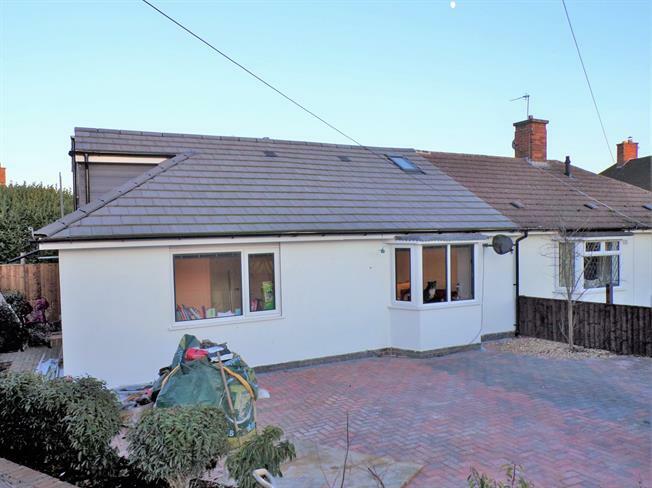 4 Bedroom Semi Detached Bungalow For Sale in Leicester for Asking Price £250,000. This bungalow has been extended across the rear and a first floor has been created to over generous living space over two levels. The property showcases a fantastic kitchen which has a well designed island and is finished to a stylish, contemporary style. The kitchen flows into a dining room which has double doors to the rear garden. There is a utility room and WC that also lead off the kitchen. The ground floor also has a bathroom which modern fittings, a forth bedroom / reception room and a front facing lounge that has stairs to the first floor. The first floor presents three double bedrooms and an en suite off the main bedroom. Externally there is a laid to lawn, not overlooked, rear garden designed with space for a hot tub. The front has been block paved to offer excellent driveway parking. Other main features include hot air central heating, double glazed windows with inset blinds, fitted kitchen appliances, spotlighting and built in storage. Viewing highly advised.